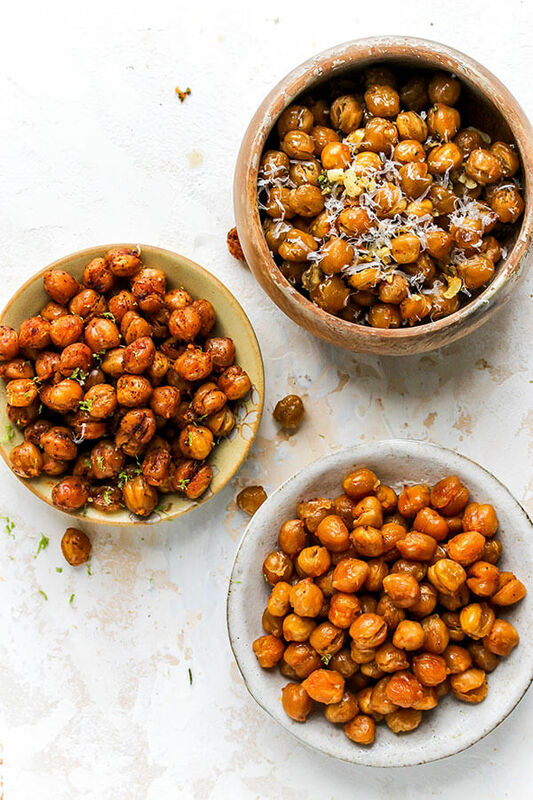 Start with basic roasted chickpeas then kick up the flavor with one these 3 clever variations: buffalo, chili lime and garlic parmesan rosemary. 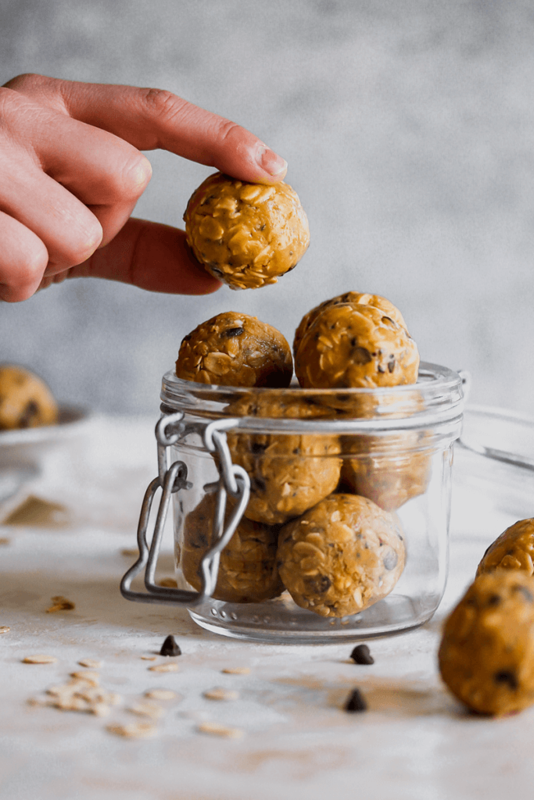 Looking for a fun new snack for you and your family? Look no further! 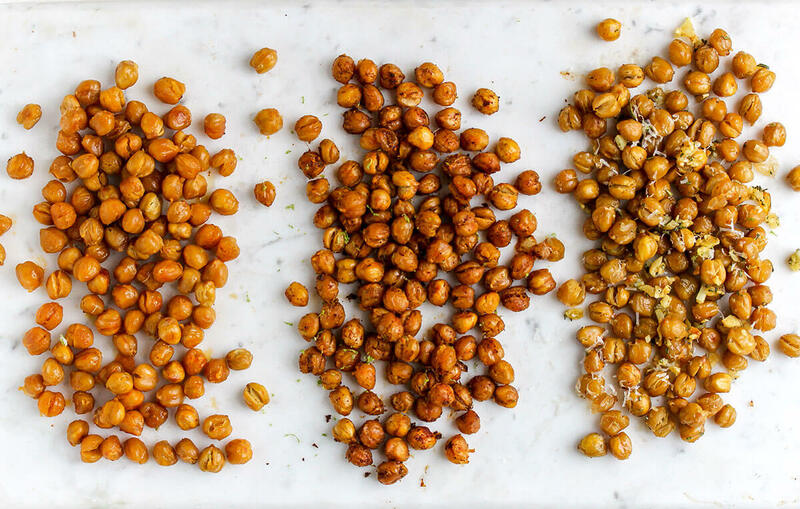 These roasted chickpeas are the perfect on-the-go snack! 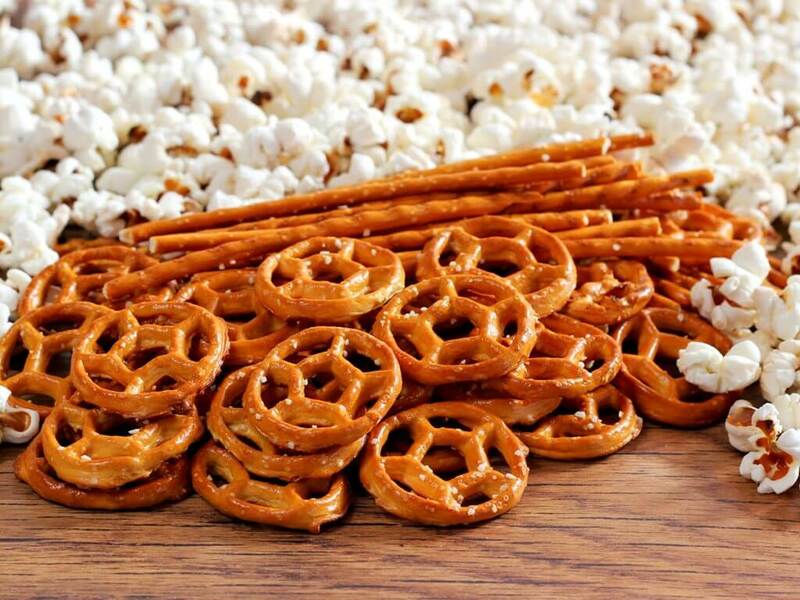 They are also great for entertaining! 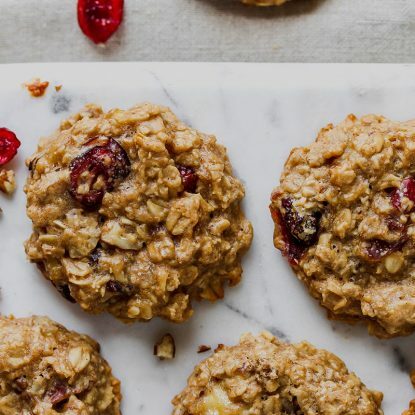 These crispy treats are a healthy alternative to the classic pub mix! Chickpeas, also known as garbanzo beans, are a great source of protein and fiber. This makes chickpeas a satisfying snack that will tide you over ’til your next meal. They are best known for their role in making hummus, but can also be used in soups, stir fries, and salads. My new favorite way to eat them though is roasted. 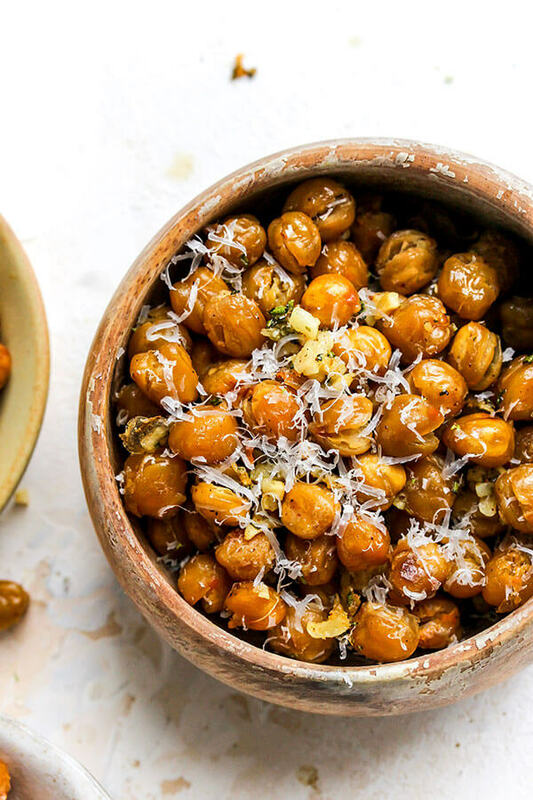 Roasted chickpeas are so easy to make–all you need is a little salt and olive oil and you are set. (See the recipe at bottom of the blog for Basic Roasted Chickpeas.) Roasted chickpeas are great on their own or spiced up with fun seasonings. Their mild flavor makes them the perfect canvas for a variety of toppings from sweet, salty, and savory to spicy and sour. After the chickpeas have finished roasting, add 2 Tbsp of buffalo sauce to the chickpeas. Stir to coat. Place back in the oven for 3-4 minutes until the hot sauce has dried. Repeat this step 2 to 3 times, until chickpeas reach desired flavor. Sprinkle with salt. Let cool and store in an air tight container. While the chickpeas are roasting, combine garlic, rosemary, parmesan, and salt in a medium sized bowl. Take chickpeas out of the oven and let cool for a minute. Place the chickpeas in the parmesan mixture and coat well. Spoon the coated chickpeas back on the baking tray. Place back in the oven for 2-5 minutes. This step is not necessary. This just helps the cheese crisp and the toppings stick better. Let cool and store in an air tight container. While the chickpeas are roasting, combine chili powder, lime juice, cumin, and salt in a medium sized bowl. Take chickpeas out of the oven and let cool for a minute. Place the chickpeas in the chili lime mixture and coat well. Spoon the coated chickpeas back on the baking tray. Place back in the oven for 2-5 minutes. This step is not necessary. This just helps the toppings stick better. Let cool and store in an air tight container. Have you ever tried roasted chickpeas? If so, what’s your favorite flavor? I’d love to hear from you! Preheat oven to 400 degrees. Rinse and drain chickpeas. Evenly spread the chickpeas on a paper towel to try (approximately 15 minutes). Once chickpeas have dried, coat them with olive oil. Spoon the chickpeas onto a baking pan, sprinkle with salt, and place in the oven. Bake 45 to 60 minutes. Every 15 minutes, take them out of the oven and stir to ensure that the chickpeas cook evenly. To check for “crispness”- take the chickpeas out of the oven, and let sit for a minute. Try one of the chickpeas. If it is crunchy, they are done and are ready for seasoning. If it is chewy, place back in the oven and continue cooking. Continue testing like this until all chickpeas are crisp and crunchy. 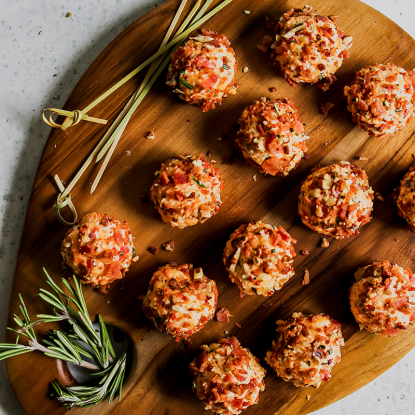 Follow the directions in the body of the blog to learn how to make 3 additional variations: Buffalo, Chili Lime, and Garlic Parmesan Rosemary. 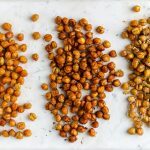 Learn how to first make basic roasted chickpeas then kick the flavor up a notch with these 3 variations: buffalo, chili lime and garlic parmesan rosemary. I love all of the variety here! Roasted Chickpeas are the best snack! These all sound and look so delicious! I just got my little one (1.5 years old) hooked on roasted chickpeas, in all fairness I do refer to them as “tiny chips”…gotta do what you gotta do. I can’t wait to try the buffalo ones! That’s brilliant! I’m so going to call mine this for the girls! 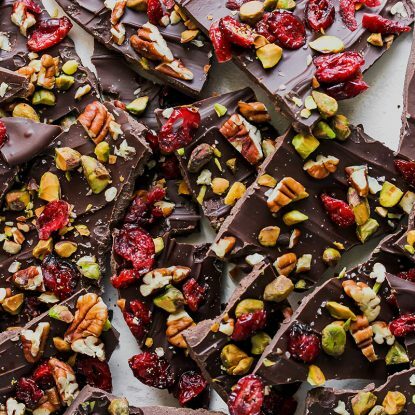 Oh my gosh I have to make all of these! They all sound amazing!